The Rohingya community first arrived in Carlow in 2009 after they were resettled from refugee camps in Bangladesh by the UNHCR. They were among the 250,000 Rohingya who fled their native land during the Burmese Military “Operation Clean Nation” in 1991 – 1992. The 64 refugees arrived without a word of English after suffering years of hardship and persecution. The group comprised of 23 adults, 14 teenagers and 27 children, all of whom had been living in a refugee camp in Cox’s Bazar, many for up to 19 years. They had never even heard of Ireland, let alone Carlow. Mohammed Rafique recalls those first days “When we got off the plane in Dublin, they had to give us blankets because we were freezing. We didn’t have the language and didn’t know anything about where we were going”. When they finally reached their accommodation and were shown their rooms, many families chose to sleep together in the one room, on the floor, in a mixture of apprehension, fear and mistrust. It was through targeted and appropriate supports that such fears were mitigated, and the basis for ongoing work was established. Indeed, one of the key factors in ensuring the success of this programme was the effective operation of a partnership group to coordinate an integrated response. This Interagency Resettlement committee was composed of relevant agencies, including Carlow Local Authorities, the HSE, Carlow VEC, Department of Education, Department of Social Protection, the Gardaí, Carlow Regional Youth Services, County Carlow Development Partnership, Carlow Volunteer Centre, Women’s Aid and St Catherine’s Community Services Centre, which was selected as the lead agency. Since those early days, numerous supports have continued to be provided to the Rohingya community, including through the work of St Catherine’s and through the first and current SICAP Programmes. . In 2015, a number of Rohingya women took part in a 20 week personal development initiative for women run in Bagenalstown called “New Futures”, funded by Carlow County Development Partnership through SICAP. Sporting developments, such as participation in the Soccer competition run by the Department of Justice and the Cricket club have also been supported. Last year Carlow County Development Partnership through the SICAP Programme provided support for the creation of the Rohingya Photographic exhibition which showed life as experienced by many members of the wider Rohingya community in the camps in Bangladesh. This exhibition was launched by the Lord Mayor of Dublin the the Mansion House and went on to numerous venues around the country and abroad, including the First International World Development Conference in Maynooth. 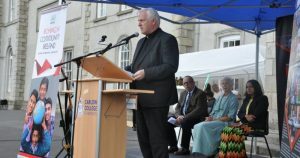 The Rohingya Remembrance Day held in Carlow College in August was also supported. This year, 2019, Carlow County Development Partnership has commissioned research on the stories and experiences of these last ten years, to document the journies travelled and to ascertain ongoing support needs of the community. It will also look at the lessons which can be learned from the Carlow experience for other Refugee initiatives in Ireland. This will be launched in early Summer along with a video and photographic exhibition. 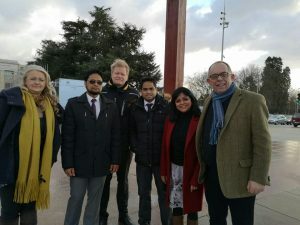 Karl Duffy, Carlow County Development Social Inclusion manager was invited, along with Stephanie McDermott of Carlow College and Rohingya Action Ireland to speak at the United Nation’s Human Rights Council in Geneva in March about the work over the last ten years in Carlow. Meetings were also held with the Irish Ambassador to the UN and with Yanghee Lee, the UN special rapporteur on human rights in Myanmar. Other SICAP supported initiatives planned for this year include a special dance project will be run in conjunction with VISUAL, training workshops with young Rohingya women and a crafts project will be also be explored, using Goal 2 SICAP funding. Training support and mentoring is also being given to Rohingya Action Ireland. 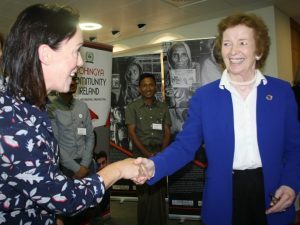 Like all other parts of Ireland, Carlow is learning what a true inter-cultural society looks like, where the distinct identities and gifts of each different community are celebrated and protected, The experience with the Rohingya community shows that local communities have a key role in developing the future shape of our society. As the Government’s 2040 Strategy states, “Without equality we cannot have wellbeing”, and the SICAP programme will continue to work for the full and equal participation of all citizens, both new and old, in the ongoing development of the county.